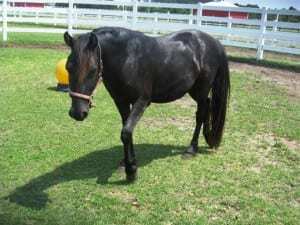 This is Ash, a two year old black Colonial Spanish Mustang Gelding, removed from the herd in January, 2012. He is an absolutely gorgeous horse with classic Spanish carriage, standing at 12 hands. Ash is currently being trained by our herd manager, Wesley Stallings, and is progressing very quickly. He now has learned to stand tied and for the farrier, load into the trailer, lead and lunge, bath, and much more! Ash is extremely gentle and loves attention. Update: Ash has been adopted and now lives in Chesapeake, VA along with Solomon.